December 29, 2018, 6PM: The Qin Song Art Center (琴歌艺术中心) will present its annual New Year's Concert at the Shenzhen Concert Hall, 6PM. In addition to other performers, Don will perform two of his songs, "A Bird Will Sing" and "The Lover's Waltz." Admission is FREE! December 27, 2018: The Yijing Primary School Performance Arts class performs a musical created in 1985 by children in Georgia, USA. Click here for details. December 11 [was the 9th], 2016: The DreamBox Performance Arts class performs a musical created in 1985 by children in Georgia, USA. Click here for details. February 21, 2016: The DreamBox school's classes resume, including Don's Performance Arts classes. Click here for details. January 23, 2016, 12PM (USA time): Don's Aunt Esther is celebrating her 90th birthday with family and friends. Her granddaughter Rachel wrote lyrics and Don set them in a country-Western setting, his first ever! You can find the music here. August 2-14, 2015: DreamBox and the CMTSC again join forces to present a music theater summer camp in Shenzhen. Don will be assisting as accompanist and music director. For details about the camp click here to see their web page. June 11, 2015: The SZ/HK Music Salon is performing for an EQXIU.COM convention: "2015 China cross-border all the chips and new three board of investment and financing peak BBS." Don will be performing with them. April 4, 2015: Don's and Delia's Surprise Birthday Party, time and place TBD. Check back here, preferably before April 4! February 27, 2015: Each Chinese New Year Beijing hosts its annual Gala Celebration, televised on CCTV. Not to be outdone, Shenzhen Theatre hosts its own annual televised Spring Festival Gala Celebration, to be held February 27 at 2:30PM. Actually, it is outdone, as the budget for Shenzhen Theatre's one-hour Gala is provided only by the government of Shenzhen, whereas the Beijing Gala's budget is nationally provided for and its Gala lasts one full marathon-like day. Don will be performing "We Are Chinese" (《我们是中国人 》). You can see Shenzhen Theatre's announcement here. December 20, 2014: Don will present a master class on Stage Communication, coaching music students on their stage presence. The Arts Alliance, Shenzhen, 10-12AM. November 29, 2014: Don has been invited by the Chinese Tao Times band to join their November 29th concert at the Shenzhen Symphony Hall to premiere his new song, "Holding Our Love Together." It is a free concert, at 3PM. November 4, 2014: The Shenzhen Nanshan Foreign Language School pages have been updated, and include a reading track to assist the cast members in their pronunciation. 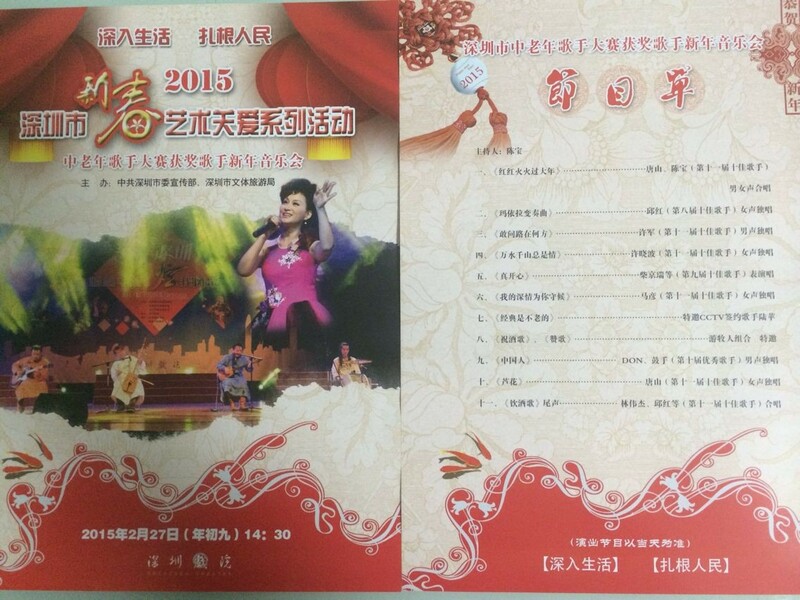 October 13, 2014: For the second year, Don will participate in the Shenzhen Elder's Singing Competition. This year there will be additional foreigners participating; last year Don was the first ever foreigner in the competition. You may see the promotional registration flyer (including the schedule and venue) here. Look closely: you'll see his picture on the front of the flyer! September 20, 2014: A link for Don's musical theatre class being held at the Shenzhen Nanshan Foreign Language School is here. August 25, 2014: "Don has a moving experience" is literal: he moved from his old apartment at Huangpu Yayuan to his new apartment at Xiangmi Shidai. Details are on his home page. August 4-15, 2014: DreamBox resumes with a two-week program in which six-to-nine year olds will prepare and present a short musical version of Peter Pan. For more information, call Cynthia (Chinese and English!) at 188-2387-3778. August 1, 2014: Two of Don's compositions have been posted on his Free Music Page. The first, his Christmas carol O Blessed Night, includes recordings, notes, and music; the second, The Lover's Waltz has a newly orchestrated accompaniment with chorus added. June 17, 2014: Performance Arts classes from BCIS gave successful in-school performances. The school in Nanshan and DreamBox do not yet have definite performance dates set, but they will be informal performances for family and friends. June, 2014: Performance Arts classes from BCIS, the school in Nanshan, and DreamBox will be performing the musicals they created sometime towards the middle and end of June. Check here for the dates and locations, to be posted here by the end of May! UPDATE: The BCIS class performances are currently scheduled for BCIS graduation day, June 13! April, 2014: Personal birthday message from Don: My friend and colleague Delia (邱红) and I wish to thank you for helping make our party a wonderful birthday celebration. Those of you who know me well enough are familiar enough to know my propensity toward laziness. With that in mind, I wish to collectively rather than individually thank people for their birthday gifts. I did not expect anything, yet received everything from trinkets to music to music boxes to fine art work. And from others, I was honored by their presence and performances, and from still others who were unable to attend, their good thoughts and wishes. And of course, I had the honor of sharing the celebration with my colleague and friend Delia. In return, in addition to my thanks for a wonderful time, I wish to offer all of you a "heads up" advance notice (or "warning," if you prefer!) of Delia's and my anticipated surprise birthday party around the same time next year. April 6, 2014, 11AM-4PM: Don and his friend Delia are joining forces to celebrate their birthdays. Don's April 1st birthday is on a very non-holiday-like Tuesday, but Delia's April 6th falls on a Sunday, so they'll mutually celebrate birthdays and April Fool's Day in one afternoon's ribaldry. A public rehearsal for an upcoming performance will take place in the Shenzhen Theatre in Luohu on March 16, starting at 9AM. It is located off the Laojie subway station, exit 4F. Performances include the soprano Marina (from the Ukraine) and baritone Don (from the States) singing the Chinese song "I am Chinese," and singers, dancers, and comedy. Contact Don if you need more information. NOTE: The PPT presentation and links are on Don's Bao'an Library page. Human history was not shaped by intelligence; it was shaped by weapons, disease, and resources (guns, germs, and steel). Is it true that 168 European soldiers successfully defeated a South American army of 80,000? Is it possible that the most intelligent people on the planet have never even seen a gun? These ideas and others will be presented and discussed. January 18, 2014, 8PM: Performance Arts class performance. Due to varied circumstance, the program (see January 17 below) has been moved to Saturday. January 17, 2014, 8PM: Performance Arts class performance. The class of 11 students will give a staged performance the short musical "Mystic Music, Holiday of Magic" at the clubhouse of Huang Pu Ya Yuan. Admission is free, but please RSVP, as space is limited. November 16, 2013:Shenzhen hosted its Tenth Annual Top Ten Singer Qiu Gong Solo Concert, and Don was a featured performer! He performed the popular Chinese song "Zhong Guo Ren" (中国人）。 Here are some links to a news video report and a newspaper review. If he finds a full video somewhere it will be added to this site. November 16, 2013:Shenzhen is hosting the finale of its Tenth Annual Top Ten Singer Qiu Gong Solo Concert, and Don is participating! When he competed on Nov. 1, the judges selected the top eight competitors for the final competition, but Don was number nine! :( But as it is the 10th anniversary for the event, they've invited him to perform his song "We Are..." as a gift to the celebration. UPDATE!!! Due to time and space constraints and program planning, his song "We Are..." is no longer on this program, but will be included in a program at a later date to be determined. Instead, Don will for the first time ever perform a Chinese song in Chinese, "Zhong Guo Ren" (中国人）。 The televised performance is at 2PM; tickets are required but may be free on a first come first served basis. November 1, 2013:Children singers wanted!!! Don is seeking school students from elementary through high school who would like to sing backup for him when he performs at the Singing Competition. It is very easy: the music and English words may be found here. If interested, please send Don an email, contact him on QQ, or give him a call, and he'll give you the details. It is open to middle-aged and older singers with residency in Shenzhen. There are two competitions, one for people 35 to 55 years old, and one for 55 and older. Don will be in one of the two groups! 老街站发出口), and is jointly sponsored by various organizations including the Municipal Party Committee Marketing Department, Shenzhen's Tourism Bureau, the city Music Association, the Shenzhen Theater, and others. Since 2004, this annual "Shenzhen Elders Singing Competition" has provided middle-aged and older friends an opportunity to share their talents on the big stage. This year is the tenth anniversary, and an official said the competition will focus on "popular taste, happiness, health, and entertainment ." Each competitor in the event is "invited to sing your story". Don has passed the preliminaries; the semi-finals are November 1, and the televised final is November 16. As voice is secondary to innovation, ability, expressive force and musical appeal, Don has a good chance to receive one of the "Ten Best Singers" award in his category! September 5, 2013: The website for the Imagine! School (in China, known as DreamBox Arts) is up and running! Still being tweaked, but is off to a good start, as is the school, as are the classes. August 12-August 25, 2013: The imagine school and CMTSC in cooperation with the Shenzhen Children's Palace will present an "International Theater Arts Exchange Program" called "Dreambox on Broadway" from August 12th through the final performance of August 25th. The performance will be at the Children's Palace. Registration is currently open for young people aged 6 to 16. See the brochure for more information. July 1, 2013: Don now resides in the Futian District of Shenzhen! See the new address at the bottom of the website's home page. June 26, 2013: Don is moving in the next few days from his Bao'an residence to his new residence in Futian. He will save more than 13 hours travel time each week by this move! June 13, 2013: The imagine! School of Creative and Cultural Arts is pleased to join forces with the Children's Musical Theatre Summer Camp (CMTSC) in presenting a summer camp in Shenzhen. CMTSC will present its camp in Beijing for the second time, and we will have a parallel camp in Shenzhen. The camp is from August 12th through the final performance date of August 26th. Due to our late start, students are expected to have at least some prior performance experience as well as proficiency in English. Registration is now open for students aged 6 to 16; older students and adults may also apply for a parallel evening program. Registration is 5,000RMB, but lets talk about scholarships to reduce costs! For more information and to register, please call the business manager, Elaine, at (+86) 135-0282-0680. CMTSC instructors are primarily native English speaking grads of Juilliard School of the Arts in New York City, who specialize in theatre, music and dance. May 23, 2013: Don is back home in China. During his visit his mother, Bettie Bernice Rosenblatt, passed away due to old age at 87. She died comfortably and with her family, after all the appropriate goodbyes were said in both directions. She will be missed, but remains an inspiration on the Art of Living to those who knew her. February 20, 2013: The story for Verse 5 of the Tao de Jing is available. You may see and support the Kickstarter project by clicking here. February 14, 2013: A Kickstarter project was launched to help fund Don's completion of his short stories collection "The Western Tao" based upon the Tao de Jing. You may see and support the project by clicking here. January 21, 2013: A video of the November 11, 2012 Shenzhen, China presentation of the Spirituality of Music is now available. January 18, 2013: The complete short one-act play, The Restaurant and the Fly, including a video of a performance, is now available. The complete description of Don's unique program for TOEFL is now posted. January 15, 2013: Finally got around to adding the 2011 Zen of Zen concert; please enjoy! January 1, 2013: Happy New Year! (Don got to experience it about twelve or more hours earlier than his family did in the U.S.) The Kickstarter project did not meet its goal, presumably due to bad scheduling around the holiday season. Check back soon, as it will be restarted shortly, and some others may be added as well. Oh, and keep in mind that although the fiscal cliff may not be as steep as some make it out to be, you may still have to be careful not to get bogged down in the mud at the bottom. Most of Don's poetry and his 2004 collection of humor called "Schwinn Fei" are online. 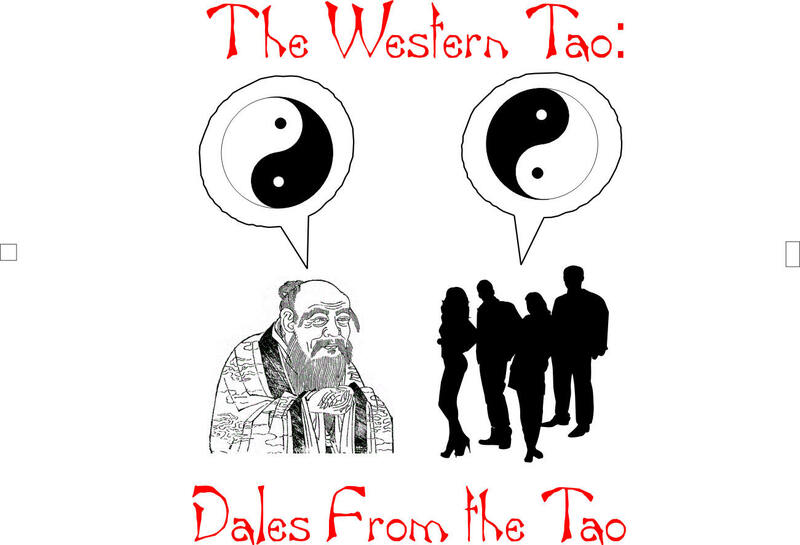 The first five stories for the Western Tao--Dales of the Tao are also now online. The completion of the 81 public domain short stories will be submitted as a second Kickstarter project; please keep your ears tuned to this Eustachian tube! Recordings of the endangered species pieces have been added to the Endangered Species Songbook page. December 7, 2012: More free music added! Don happened upon a once forgotten song he had written in 1990 that was used in a play. It is his first (and only) folk song, and was inspired by Lanford Wilson's play "Fifth of July." It is very timely for what is happening today. Discover the song "Can't Go Back Again" here. November , 2012: As the Performance Arts director for Nexus Information Consulting, Ltd., I am looking for an appropriate venue for rehearsing and performing drama. Space is needed for an adult program, for a children's program, and for a semi-legitimate theater troupe. It may end up being anywhere from one to three venues. What is needed for each is a rehearsal space capable of accommodating up to 30 people, and a stage with drops and sound and lighting that is also capable of accommodating at least a small band or orchestra. Any suggestions are appreciated, and may be sent to my email at don@orfeomusic.org . November 11, 2012: Don's famous talk on "The Spirituality of Music" will be given at the Bao'an Library's Sunday "English Salon." The Salon, starting at 10AM and finishing at noon, is a regular Sunday feature of the Bao'an Library, and is free and open to the public. As his presentation uses a bilingual slide presentation, non-English speaking people can understand it fully and share in the enjoyment of this very special presentation. So be sure to bring your non-English speaking friends! The Bao'an Library is in the western Shenzhen district of Bao'an; click here for map and directions; click here for a listing of English Salon events. Click here to preview the entire Spirituality of Music presentation in English and Chinese. September 25, 2012: Don is now associated with Nexus Information Consulting Co. Ltd. (耐思信息咨询有限公), a China-based consulting firm started by entrepreneur Chris England. Its projects include trade, HR sourcing and placement in education, software development, and applied education. Don is taking charge of developing performance arts programs and products. July 25, 2012: Yay!!! One of the three groups of four students coached for the CCTV National Speech Competition won fourth place in the national standings! Congratulations to students Jack, Leo, Grace, and Lynn! July 16, 2012: Don has returned to the first school he taught at in China, helping to recruit new students, and teaching Middle and High school students the art of speech-making for a national contest sponsored by the National television network, CCTV. He has already received a special recognition for his work. He returns home to Shenzhen August 11. June 21, 2012: China-UK College's 5th grade Performance Arts classes gave their final performances. Under Don's guidance, the five 5th grade classes had conceived, written, composed, casted, rehearsed and performed their own productions at their school in Shenzhen. January 20, 2012: In the morning Don returns to China via United Airlines (prefer China Southern! ), and arrives in Hong Kong, January 21st in the evening. After customs at Hong Kong airport and again at the Hong Kong/mainland checkpoint (an hour train ride to get there), he will travel another hour to arrive home sometime around 11PM. Jet lag will probably see him sleeping late on the 22nd. January 15, 2012: Don will present a talk about China to the Modern Mind Group of the Unitarian Universalist Congregation of Atlanta (UUCA) located in Atlanta. His talk, "China 2012: A Futuristic Retrospective," will explore many of the beliefs Westerners have regarding China, and will expose sources of some of the myths regarding freedom, politics and economics in China. It is at 9:30AM in rooms 209-210, on the back left side when entering through the front door. Free childcare is available; directions to the church are here. NOTE: You may see the PowerPoint presentation, articles and the links to his resources on the China Talk page. October 15-16, 2011: Don will participate in Riptide Coaster Raid's upcoming visit to Wutong Shan in Shenzhen. Of the twelve artists presenting, he will be the one providing music. His project: find someone native to Wutong Shan and collaborate to create a song about Wutong Shan to be presented at the event. Click here for additional information about Coaster Raid. He will be there most of both days; the time of his special 30 minute presentation has not yet been set. September, 2011: Links for China-UK College students are here. September, 2011: Don is the new "Performance Art" teacher at 中英公学 (zhong ying gong xue), China-UK College. The school's website (in Chinese) is http://www.zygx.com.cn. You may see his presentation at school (including pictures) about the dangers of smoking here. July 23, 2011: Don's first Zen of Zen concert, to be presented at F518 Idea Land in Bao'an, Shenzhen. The first half will be various compositions including songs written in China, and even a couple in Chinese! (Someone else will be singing, though.) He will also accompany his arrangement of a traditional Chinese song. The second half will be all music and no talk, all improvised and personalized for the audience. The concert is free, but visitors will have an opportunity to contribute in exchange for a copy of the poster signed by Don. Additional information about Don's concert may be found here in Chinese and here in English. His promotional poster may be seen here. March, 2011: Back in Nanchang February after a month's visit to the States. Celebrated my parent's 68th Wedding Anniversary and my father's 89th birthday! The Winter Dayu term begins early March. March 12, 2010: "Spirituality of Music." Don's famous talk about music as language. People say their musical experience is never again the same upon hearing this presentation. Presented at his school, Jiangxi Dayu, Wanli District, Nanchang, Jiangxi. February 14, 21, 2010: Don will play music for the Sunday morning services at the Unitarian Universalist Church of Gwinnett in Lawrenceville, Georgia (click for map). The service begins at 10:30AM. January 27, 2010: Don will present his talk "China – A Futuristic Retrospective" at the Unitarian Universalist Church of Gwinnett in Lawrenceville, Georgia (click for map). The talk begins at 7:00PM. The optional dinner starts at 6:30PM, but if you want to join in the dinner, you must RSVP with Lois by Monday. Her number is 770-806-8305. The talk is free; dinner is $7 per adult, $4 per child, and $20 max per family. A list of un-annotated links to my resources for this talk may be found here. February 6, 2010 (moved from January 23): Home Concert -- Cobb County, Georgia. Don will be performing at a private home concert. Click here for details and to find out more about home concerts. January 11, 2010: Don is the featured January speaker at the monthly meeting of the Atlanta Nation Discussion Group (Atlanta, Georgia). Don is the featured January speaker at the monthly meeting of the The meeting will be at the new Avis G. Williams Library on McConnell Street in Decatur, at 6:45PM. The topic: "China – A Futuristic Retrospective." November 13, 2009 -- A newspaper story is published in ; click here to see the online version. 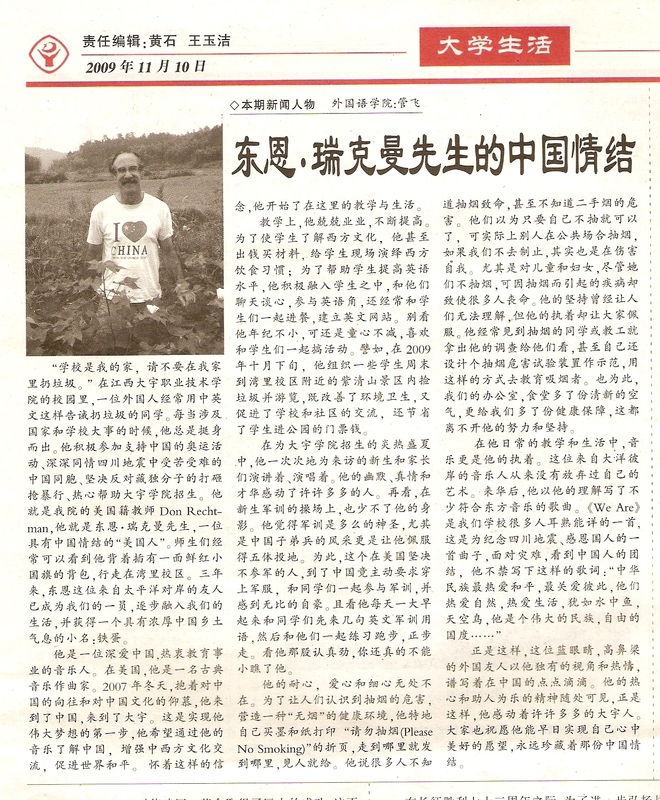 November 10, 2009 -- A story about Don is published in 江西大宇学院报 (Jiangxi Dayu Xue Yuan Bao), the Jiangxi Dayu College school newspaper. September 9, 2009 -- After another 11 months of dormancy, OrfeoMusic.org is back up! There were ongoing difficulties with translation to get the involved parties to successfully move the site to its Chinese host. In America, Don was a computer guru; in China, Don is a computer idiot! June 17, 2008 -- After six months of dormancy, OrfeoMusic.org is again being updated to reflect Don's current living situation. The site updating is scheduled for completion by July 1, 2008. September, 2007 -- Don is an instructor of English as a Second Language (ESL) and of music at one of the major private universities in China, Jiangxi Dayu Vocational and Technical University, Nanchang, China. February 2, 2005 -- Don has accepted the position of Music Director for the Unitarian Universalist Congregation of Gwinnett, in Lawrenceville, GA, a Northeast suburb of Atlanta. He'll be building their music program from scratch.